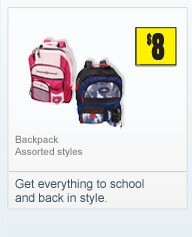 Family Dollar is featuring Disney backpacks or lunch bags at $6 each. It is also featuring four-pack Kraft Handi-Snacks or four-pack Kool-aid Gels for $1 each to help fill those lunch boxes. Along with Disney and other character school supplies, the 99-cent Only Store has lunch box treats like Florida's Natural Fruit Sticks in a six-pack for 99 cents or seven mini snack boxes of Sunmaid raisins for 99 cents. Dollar Tree also has lunch box snacks like potato chips, juice boxes and fruit roll-ups in multi-packs for $1. Dollar General is offering licensed lunch boxes in assorted styles for $5 each and backpacks in assorted styles for $8 each. I can't tell from the picture, but these backpacks look to be made of nylon material and look to have some outside pockets, whereas the Disney ones at Family Dollar look like they're some I've seen that are made of soft vinyl. If it were me, I'd go for the sturdier material. Socks is one item of clothing that you can save a lot of money on by shopping at a dollar store. Dollar Tree is featuring kids and adult sizes in solids and patterns for $1 a pair and the 99-cent Only Store has sport socks for 99 cents a pair. I've bought socks from my local dollar store and they've stood the test of time and many washings. And Dollarama has some really cute kids socks. Marlene Alexander is a freelance writer and dollar store diva. She writes about budget decorating using only items from the dollar store.